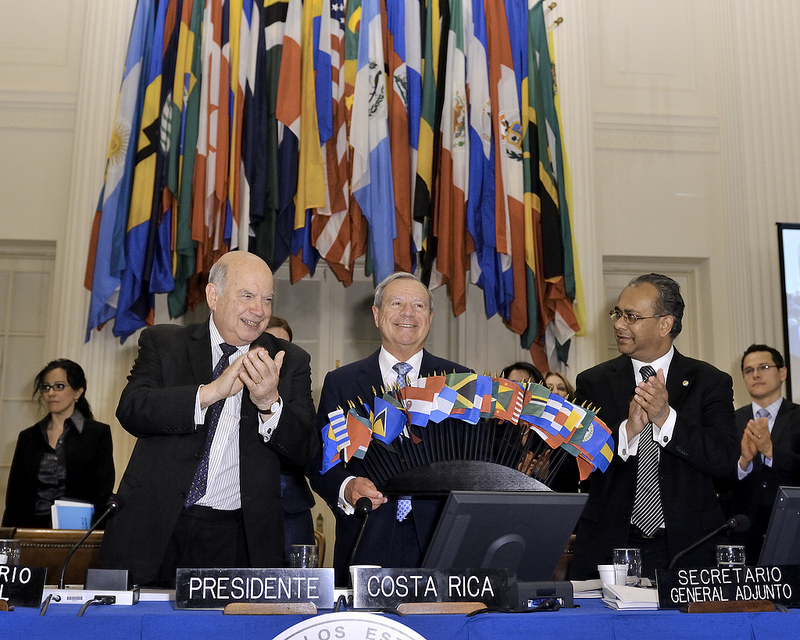 Just before midnight on Friday, March 22, the General Assembly of the Organization of American States approved a resolution making specific recommendations to OAS Member States and the Inter-American Commission on Human Rights ostensibly aimed at strengthening the regional human rights system. 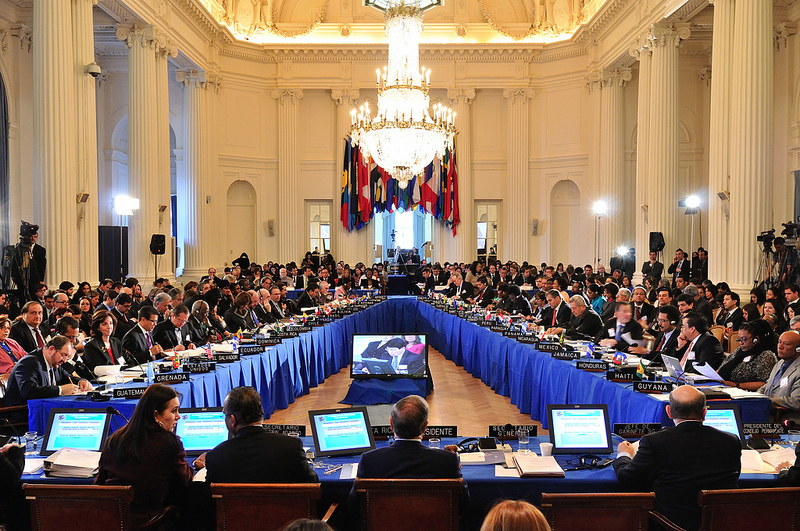 The resolution closes a contentious two-year process of reflection on the Inter-American human rights organs, but requires the OAS Permanent Council to continue the dialogue on additional proposals for change, which are likely to be controversial. [IPS] Although the thirteen-hour special session failed to fully alleviate concerns about whether, to what extent, and for how long the OAS political organs may seek to “reform” the Inter-American Commission on Human Rights, the OAS General Assembly mostly held off efforts by a small group of States to restrict the Commission’s practices and procedures in key areas of its work. Proposals by this group of States – Ecuador, Bolivia, Venezuela, and Nicaragua – had included recommendations to limit the funding of the Inter-American Commission (by prohibiting earmarked voluntary contributions), reduce the budget and autonomy of the Special Rapporteurship on freedom of expression, limit the Commission’s authority to grant precautionary measures, and eliminate Chapter IV of the Commission’s Annual Report in which countries with particularly troublesome human rights conditions are highlighted. While the final resolution did not adopt the recommendations that had posed the greatest threats to the Inter-American Commission on Human Rights’ autonomy and mandate, the agreement will allow those proposals to be rehashed and possibly put to the Inter-American human rights organs in the future. The resolution originally contained three footnotes (since removed), in which Guatemala: recommended that the Permanent Council dialogue focus on the issues of the Commission’s location, precautionary measures standards, and term limits for commissioners and rapporteurs; proposed 2015 as a target for achieving full financing of the system; and, suggested that all the Commission’s rapporteurships be headed by commissioners (instead of independent experts, as in the case of the Special Rapporteurship on freedom of expression). The final resolution, approved by acclamation, was the subject of intense debate and, in the end, was the product of significant compromise to accommodate the views of the Bolivarian Alliance of the Americas (ALBA) countries that remain interested in changing the way the Inter-American Commission operates. These governments have voiced strong criticisms of the Commission and have argued that it lacks authority to grant precautionary measures and should reduce the budget and autonomy of the Special Rapporteur on freedom of expression, do away with Chapter IV of the Annual Report, focus more on general promotion activities and on economic, social and cultural rights, be headquartered in a State party to the American Convention on Human Rights (which the United States is not), and be open to only to those States that have ratified the Convention. The more constructive elements of these proposals – promoting universal ratification of the American Convention on Human Rights and supporting additional resources for the other rapporteurships – were taken up in the final resolution’s text; others were included in Guatemala’s footnotes. The draft resolution, CP/doc.4845/13 rev. 1, which formed the basis of discussion at the beginning of the day, put forward several possible versions with regard to the financing of the system (leaving unresolved whether earmarked contributions would be permitted), retained different options on key verbs (“request” versus “encourage” or “urge”), and did not contain what is now Paragraph 2 (instructing the Permanent Council to continue the dialogue). (as reported by the IACHR via Facebook; unofficial translation). During the plenary session, States reiterated their positions – fleshed out in earlier meetings on the reform proposals – favoring or opposing different aspects of the recommendations. Several States, including Argentina, Mexico, the United States, Chile and Canada, announced they would be making additional voluntary contributions to the Inter-American Commission’s budget and emphasized their support for a robust regional human rights system. After 8:30 in the evening on Friday, the General Committee introduced a second draft, AG/CG/doc.1 (XLIV-E/13). That document contained new language directing the Permanent Council to continue the dialogue on strengthening the Inter-American system “through Member States’ observations on the [IACHR’s] Strategic Plan and the consideration of its Annual Report to the General Assembly.” With regard to that draft, 22 States expressed their support, 4 were opposed (Nicaragua, Venezuela, Bolivia and Ecuador), and 3 thought additional discussion time was needed. In the ensuing debate, the four opposing countries argued in favor of including language regarding a possible relocation of the IACHR’s headquarters and modifying paragraph 2 to broaden and formalize the ongoing dialogue on additional reforms; they threatened to abandon the OAS if these issues were not addressed. While some participants – including Canada, Jamaica, Mexico, Grenada, Mexico and the United States – urged the General Assembly to end debate and vote on the second draft, others – including Argentina, Guatemala and Peru – expressed regret at the lack of unanimous support for the draft and endeavored to broker another compromise. 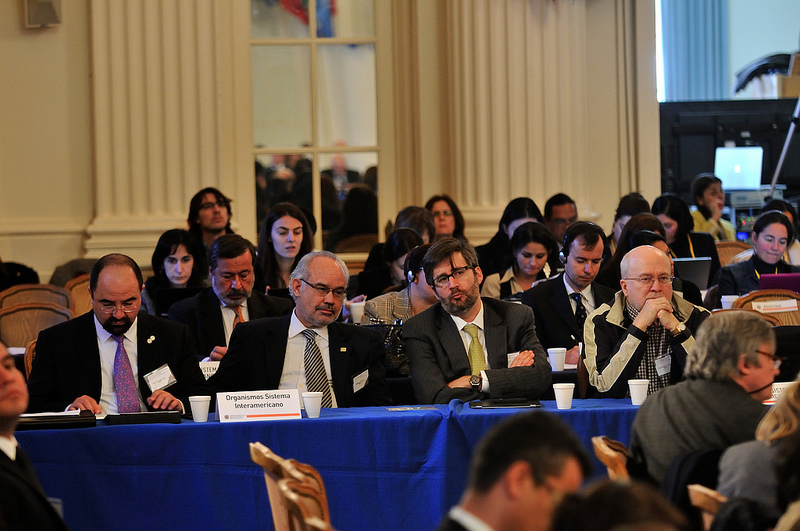 Argentina, through foreign minister Héctor Timerman, took the lead in negotiating a revised draft that Ecuador, Bolivia, Venezuela and Nicaragua could support. At first, Ecuador rejected Argentina’s proposal to modify Paragraph 2 to mandate a broader ongoing discussion within the Permanent Council on additional reforms. But, an hour later, Ecuador reconsidered and asked to hear Argentina’s proposal again. Shortly before midnight in Washington, Ecuador said it approved of Argentina’s proposed amendment and that it had the backing of all the ALBA countries. The resolution, as amended, was immediately adopted. This process has not been focused on improving the effectiveness or response of the IAS, nor the level of States’compliance with the decisions of the Commission and the Court, which is the main weakness of the System. Nor has it been oriented toward improving victims’ access to the Commission and the Court, nor the effectiveness of these human rights organs to give them a quick response, which is the raison d’etre of the System. Nor has it been concerned with improving the procedures for selecting candidates as Commissioners, and Judges, which is a pressing need of the System. The feeling among civil society groups and other supporters of the Inter-American Commission on Human Rights following Friday’s midnight vote seemed to be one of relief that the result was not as detrimental as it could have been, coupled with disappointment that the struggle to defend the Inter-American system will have to continue and apprehension at what may lay ahead. See previous posts for more information on the OAS-led reform process, civil society inputs, the IACHR’s own reforms, and recent efforts by Guatemala and Venezuela to limit the reach of the Inter-American human rights organs. Resources and information on advocacy before the Inter-American Commission and Court are available on our Inter-American Human Rights System page.